Contemporary outfit including a black jumper or pinafore dress. A jumper (in American English), pinafore dress or informally pinafore (British English) is a sleeveless, collarless dress intended to be worn over a blouse, shirt or sweater. In British English, the term jumper describes what is called a sweater in American English. Also, in more formal British usage, a distinction is made between a pinafore dress and a pinafore. The latter, though a related garment, has an open back and is worn as an apron. In American English, pinafore always refers to an apron. A sundress, like a jumper, is sleeveless and collarless; however, such articles are not worn over a blouse or sweater, and are of distinctly different cuts and fashions. The apron dress may be viewed as a special case of the jumper. 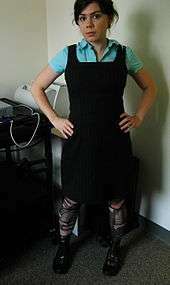 If the design of the dress is directly inspired by an apron (having a bib in front and ties in the back, for example), the garment is typically described as an apron dress. Wikimedia Commons has media related to Jumper dresses.